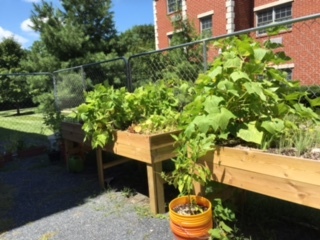 Earlier this year, I was asked by the the property manager at Selborne House in Ellicott City, if I would design a small community garden for residents interested growing their own vegetables. After viewing the area around the residence, I gave the property manager several options from which she chose to make two large raised container gardens, measuring 10 feet long, two feet wide and a foot deep and three feet off the ground, along with multiple 5 gallon bucket containers. 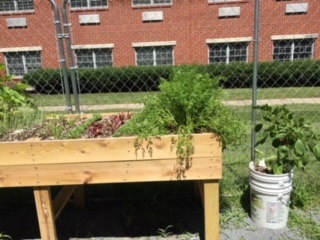 In May, we filled the containers and I conducted a class with the residents, discussing the vegetables which would grow best in the containers. I also made the residents aware that the growing media needed to be kept moist and fertilized every two weeks, since the planting media contained no nutrients. From the looks of the following pictures, the residents are doing well. 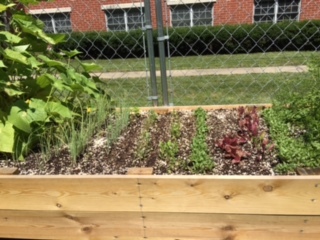 They are growing green beans, carrots, onions, lettuce and peppers in double 5 gallon buckets. In early September, I will be conducting a class on planting fall vegetables (spinach, beets, lettuce, broccoli and other brassicas) as their summer vegetables are harvested. It’s been an interesting experiment in container gardens and I look forward to talking to the group about fall vegetables and planning for the so called short day factor which adds two weeks to the to days to maturity because there is less daylight in the late summer and early fall. ← Cucumber issues – and GIEI Open House!